The Ready Made House Designs offered here ignore the automobile because David Murray Architect feels houses are improved both aesthetically and formally by keeping the automobile at a comfortable distance. As a roof to receive photovoltaic panels the garage performs another service function that is best left off the main house. 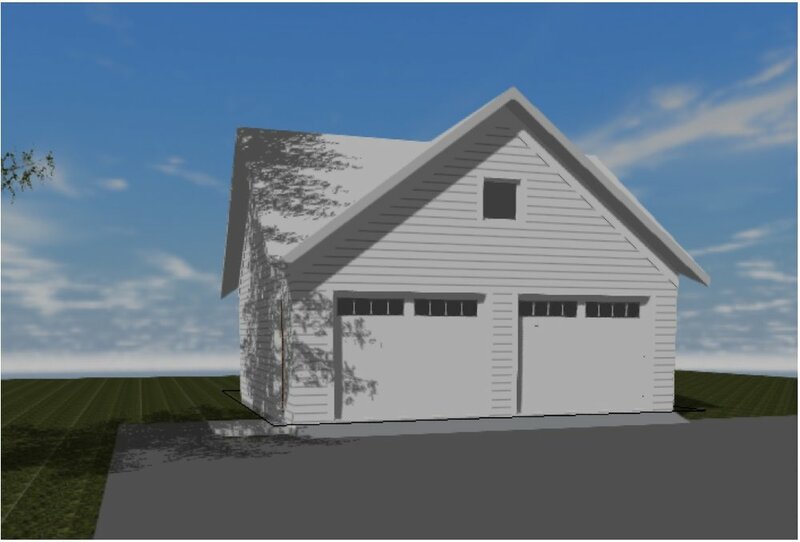 This Garage Series of designs are offered as a compliment to the Ready Made House Designs. This Modern Style Garage design employs a mono pitch roof to provide a simple form and functions as a home for the photovoltaic panels. Based on the solar orientation and the site layout the doors could be at the high or low side of the pitch. This design faces South with a large photovoltaic array on the front and a full shed dormer on the North side making for a large studio space above.